To inform the landscaping study for the Regional Index for Western Africa, the Access to Seeds Index team visited several farmer cooperatives in Burkina Faso. In the region around Ouagadougou, the team saw fields full of sorghum and millet, so-called dry land cereals farming families use as staple crops. 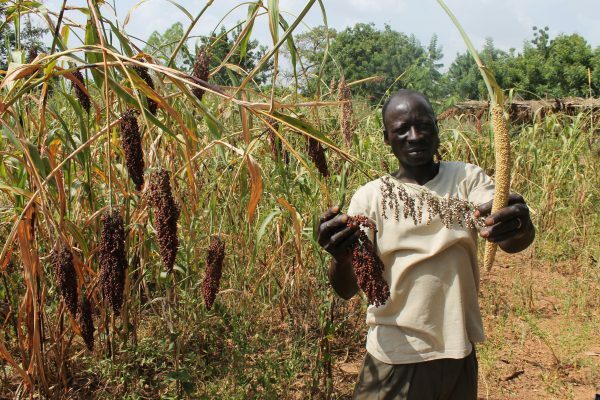 Sorghum grows well in arid and semi-arid zones but is not very nutritious. Scientists working on biofortification (adding micronutrients like iron and zinc) were awarded this year’s World Food Prize. See the photo report of this part of the trip on our Facebook site. In Western Africa the production of seeds for staple crops lays primarily in the hands of seed producing farmer cooperatives, using foundation seed provided by government research institutes. The Union Nationale des Producteurs Semenciers du Burkina (UNPSB) has 4500 members. One of the members, seed producer Eloi Ouedraogo, organised a trip to various cooperatives active in the central region. The team also visited a women farmers cooperative. In 2006, 50 women farmers started their own cooperative, to ‘get out of the misery of doing all the work, while the men collected all the money’. Currently, the cooperative has 750 members in the community and 3267 members in the region. The community focuses on niébé (black eyed pea or goat pea).